Only manufacturer that offers a 10” VGB compliant drain designed & engineered for large Debris Removal! The PDR2 10” Drain is designed for use not only with in-floor cleaning systems; it is designed for all pools where a standard VGB certified non-debris removal or "circulation only" drain will become easily blocked by leaves and debris. Engineered with Dual Levels of Protection. 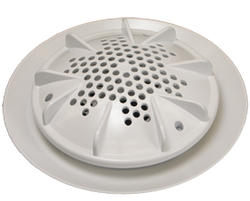 Just like the AVSC Drain the PDR2 Drain is designed with an internal Safety Baffle. This is a second level of protection that keeps the swimmer from coming in contact with the suction inlet in the event the cover is broken or missing (the cause of most entrapment cases). Safety is our primary concern! Two models available, one for “engineered sumps” and one with a manufactured sump. Designed with a large opening for debris removal. The large opening allows for even the largest of debris to pass into the drain. VGB certified Retro fit model available. The Retro fit model will fit into all previous versions of A&A's 10” drains and will bring them into compliance with VGB 2008 - ASME/ANSI 112.19.8a 2008 (ANSI/APSP-16 2011). This is perfect for remodeling of pools with out-dated A&A drains.. The large debris removal opening makes the PDR2 "Retro" Drain ideal for use in ALL swimming pools, not just for use with in-floor cleaning systems.